Marc Latham steps beyond Stonehenge to point out other stone circle sites that might be of interest on the longest day of the year (or anytime, really). THOUSANDS OF PEOPLE in the UK celebrate solstice at Stonehenge twice a year, but this is only one of over 1,000 stone circles in Britain. Maps of prehistoric Europe show how Stone Age humans traveled across the channel from mainland Europe into what is now southeast England, and then spread out to the north and west. The Megalithic and Beaker cultures dominated Britain two thousand years later, and they built the great stone structures that still grace the islands today. Trips previously described sites in the Stonehenge and Avebury area. Just in time for Summer Solstice 2010, here are seven of the best of the rest from southwest to northeast. Traveling southwest of Stonehenge to the Dartmoor National Park wilderness, you’ll find the double ring site of Greywethers. 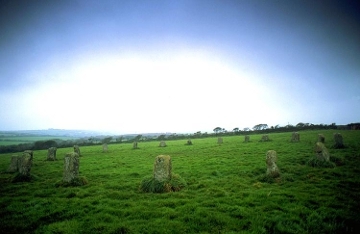 The stone circles stand beneath Sittaford Tor, between tributaries of the North Teign and East Dart rivers, and the undeveloped surroundings allow you to imagine the cultures that used the stone circles for reasons lost in the centuries that have since passed. There has been some restoration work on the circles, which are almost joined, with 49 grey granite stones altogether: 29 in the southern circle and 20 in the northern. The stones are three to four feet high, and both circles are just over 100 feet in diameter. Farther southwest, towards the tip of Land’s End, the Merry Maidens is a circle of 19 well-preserved, four-foot-tall stones in a 77-foot-diameter perfect circle, just off the B3315 road. A legend, perhaps started by the early Christian church to control paganism, claims the stones are women punished with petrification for dancing on the Sabbath. The Merry Maidens are also called Dawn’s Men, thought to be a derivation of “Dans Maen,” or “Stone Dance” in Cornish. 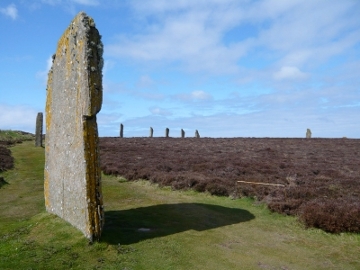 Out of sight to the northeast are two more 12-foot stones that are the pipers of the legend, while a fiddler stone is visible from the circle to the west. Northeast of Stonehenge, between London and Bristol on the Oxfordshire-Warwickshire border, are the Rollrights. Seventy-seven stones make up the 103-foot perfect circle in a clearing in the woods. There is also a King Stone and the Whispering Knights burial chamber. These are said to be part of another petrification legend, involving a witch who tricked the King and turned him and his army into stone. The King Stone is just over 200 feet northeast of the circle, across a road and the border with Warwickshire. Beyond the rolling green hills and other notable areas of prehistoric activity in the north, Cumbria has two notable stone circles. 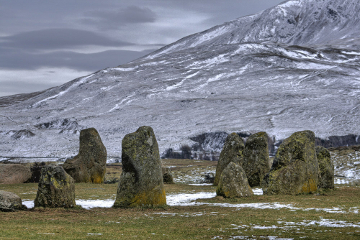 Within the Lake District and surrounded by broad mountains is the Castlerigg circle. It’s thought to be one of the first stone circles built in Britain, and has space on its northern side for what may have been an entrance. There are 38 quite large stones (the highest is about seven feet) creating a circle with a 90-foot diameter, and another 10 stones forming a rectangle within the circle. There’s also a mound inside the circle, probably for burial purposes. The site seems strategically placed to get the best view possible, and sitting against one of the great stones on a sunny evening, I enjoyed the view south to the long flat mesa of Skiddaw and north to the sharp peak of Blencathra. 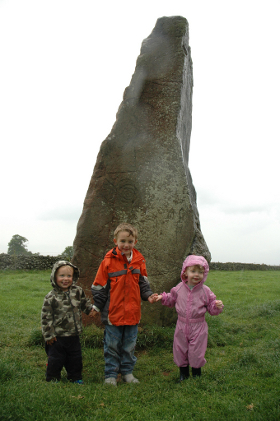 Long Meg is the second outstanding site in Cumbria, and its circle is the third largest in England (after Avebury and Stanton Drew) at 359×305 feet. On a hillside near Penrith, in the village of Rudston, Long Meg is an outlier stone standing 238 feet southwest of the circle, aligned with the mid-winter sunset. It is 12 feet high and overlooks the up to 60 “daughter” stones that form the circle. Long Meg is also made of a different substance than the others — red sandstone — and has numerous Bronze Age spiral carvings visible on it. Continue north through Scotland’s Highland mountains and across Loch Roag of the Outer Hebrides and you’ll come to the stones of Callanish, on the western side of the Isle of Lewis. They stand in a cross shape rather than a circle, but this has nothing to do with Christianity, as they predate Christ by two thousand years. An inner circle has 13 big stones, with the largest 12 feet high, and a small chambered cairn. Then there are about 40 other stones divided into four paths that provide approaches to the center from the cardinal directions. Scotland’s other islands are home to the Ring of Brodgar and the Stenness Stones, two circles facing each other across Loch Stenness. 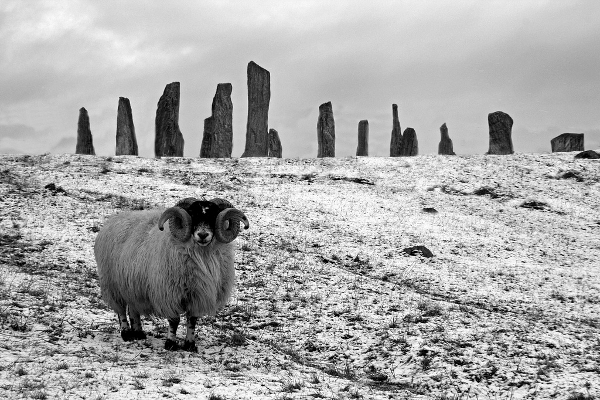 Brodgar is a true ring of 27 stones standing up to 15 feet high on a thin promontory between the Harray and Stenness lochs. Its 340-foot diameter gives it exactly the same size as Avebury’s two inner rings. The stones are set within a circular ditch about 10 feet deep and 25 feet across that was dug out of solid bedrock. The surrounding area has many interesting sites, including the Stones of Stenness. Although only four stones are left standing out of the original circle, they are much bigger than those at Brodgar, with the highest about 19 feet. For a comprehensive listing of ancient stone sites in the British Isles and Western Europe, check out the Stone Pages. If you’re up in Scotland chasing stones, you could also try Hunting the (Other) Loch Monster in Morar, Scotland, and Boozing Through 5 Whisky Distillery Tours In Scotland. Their stargazing is supposed to be good, too.